The concept of energy self-sufficiency for American agriculture is receiving increasing attention. Steadily rising farm fuel and electricity costs, which totaled $7.9 billion in 1979, are encouraging farmers to begin moving in that direction (USDA,1980).1 The possibility of supply shortages or interruptions during planting and harvest times provides an added incentive. Energy self-sufficiency is one way to reduce agriculture’s vulnerability to energy shortages and price increases. Al­though energy price increases in the 1970s had little adverse impact on agricultural output, there is considerable concern that shortages or interruptions could result in dramatic in­creases in production costs and substantial production cut­backs (Buttel et al., 1980). These possibilities influenced the Department of Agri­culture’s decision to support the self-sufficiency concept. Its announced goal of energy self-sufficiency for production agriculture by 1990 would be reached by conserving energy and by developing and applying alternative sources (Williams, 1979). Preliminary estimates suggest that solar, wind, and biomass energy could account for 25% of the net energy re­quired, with energy consumption contributing the balance. A long-range USDA research plan has identified 27 use categories where energy reduction is possible (USDA, 1979). The categories with greatest potential are irrigation, tillage, crop drying, greenhouse heating, space heating of livestock and poultry buildings, and water heating for dairies. A related area with potential for savings is farm residences. Most research dealing with on-farm sources of energy involves capital-intensive methods, such as generating methane from manure produced in confinement buildings and large feedlots. The resulting systems would be purchased from commercial suppliers, and would usually cost more than most farmers are willing to pay. There has been little publicly supported research on low-cost, owner-built systems that utilize the labor and know-how of individual farmers (Blobaum, 1980). Most of the commercial systems being developed have not been demonstrated on working farms. The main government-initiated demonstration program began in 1978 and now involves model projects on about 90 farms (DOE, 1978). This on-going USDA effort is testing systems designed to reduce fossil fuel consumed in drying grain and other crops, heating and cooling greenhouses, and heating livestock and poultry buildings. Nearly all are commercial applications designed for larger farms where the operators are more likely to purchase energy systems than to design or build their own. The first systematic effort to demonstrate the full range of proven energy applications on working farms was undertaken by the Small Farm Energy Project, a national research and demonstration project funded in 1976 by the Community Services Administration. This 39-month effort was designed to show how far a group of 25 farm families could progress toward energy self-sufficiency with an energy education program, individual technical assistance, and cost-sharing. This approach emphasized energy conservation, including weatherization, and site-built solar and other energy systems. Participating farmers were encouraged to reduce the quantity of energy they purchased by making their operations more energy efficient and by producing some of their own energy. Although the technical feasibility of all the innovations adopted by the farmers had been established, their economic feasibility and their appropriateness for family-operated farms with limited capital and cash flow had not been demonstrated. The innovations included production of Flow energy (solar, wind and biomass), resource recycling (efficient manure handling and production of compost from manure), and conservation of fossil fuels (weatherization and minimum tillage). The project had six main objectives: 1) measuring the types and amounts of energy used by farm families operating diversified crop-livestock units; 2) calculating the energy and monetary effects of various innovations; 3) developing an income and energy record keeping system; 4) testing various approaches to providing technical assistance on energy innovations to farmers; 5) developing an energy education program suitable for farmers; and 6) testing cost-sharing as an incentive for adoption of energy innovations. Fifty full time operators of crop-livestock farms in Cedar County in northeast Nebraska were selected late in 1976 as project participants. All were limited-resource farmers with net incomes below 125% of the poverty level established by the federal government. None had ever been involved in an organized energy conservation program or had any experience with solar or other alternative energy systems. Twenty-five were selected as cooperators and received technical, cost share, and other assistance over a three-year period. The other twenty-five were selected as a control group that only had to maintain detailed energy and income records. This included filling out record books provided quarterly. No energy-related assistance was provided to the control group. The cooperators were selected from among 70 farmers who submitted applications after reading about the project, attending local information meetings, or receiving a mailing sent to farmers on lists obtained from two local banks and the county office of the Farmers Home Administration (FmHA). Ml of the applicants expressed interest in participating in an innovative energy project. Control group members were recruited from among limited-resource farmers who did not respond to project-related publicity or mailings. Neither group was a representative sample of farmers in Cedar County or any other geographical area. An attempt was made to match the two groups on an aggregate basis. Table 1 shows, for example, that average farm size for the two groups was identical (357 acres) and that the average number of family members was about the same [4.96 for the cooperator group and 5.00 for the control group). This was important because the project covered energy used for both family living and the operation of the farm. 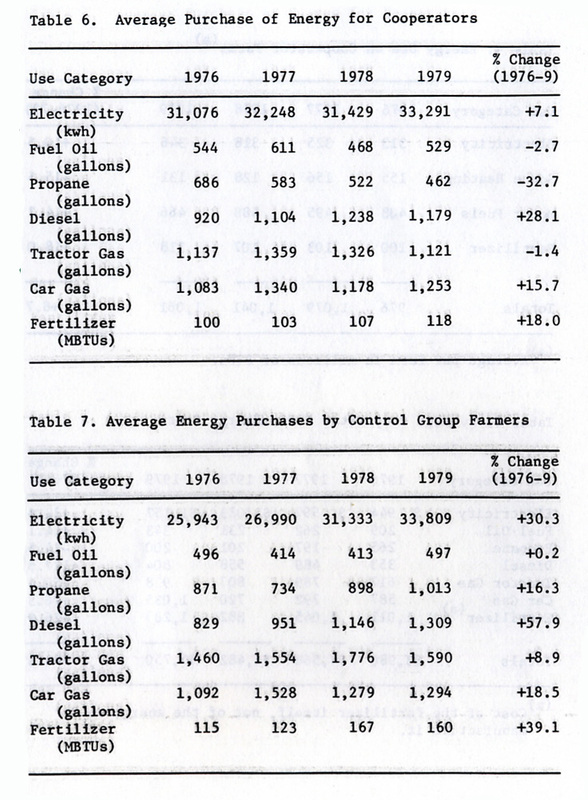 Energy use data for the two groups for 1976 provided further evidence that they were well matched. Farm records showed that the average consumption of purchased energy was 976 million BTUs for the cooperator farms and 978 million BTUs for the control group farms. Another indicator of a good match was the 20% increase in use of motor fuels, including gasoline and diesel fuel for tractors, for both groups of farms in 1977 as field operations were stepped-up after a three-year drought. An important constraint for the cooperating farmers was that they did not have farm income that could be diverted from living expenses and invested in alternative energy systems. Their average gross income was $33,000 in 1976, the year they were selected, and average net income per farm was $2,600. The cooperator families spent an average of $3,986 in 1976 for purchased energy. Consequently, the project decided to use cost sharing, a method of providing financial assistance that has been used for many years in federal farm programs. This provided some initial capital to cooperating farmers trying new energy innovations and reduced the risk involved. Federal energy tax credits did not become available until after the project was underway. Although all of the cooperators except one owned some of the land they farmed, including the site of their homes and other buildings, they were unable to obtain financing for their energy systems from the Farmers Home Administration. This federal agency, which makes low-interest loans to limited-resource farmers, was unwilling to make loans on solar systems. Local bankers, who supported the project in the community, were willing to make loans. But they were available only at a higher interest rate than loans for livestock, machinery, and equipment. Most of the cooperators, as a result, covered their share of the cost of solar and other systems from savings or cash flow. They invested a total of $29,700 in cash (an average of about $1,200 per farm), a considerable amount of used lumber and other recycled materials, and hundreds of hours of time in the projects. The balance of the financing came from cost-sharing payments, which ranged from 10% to 75% of the cost of purchased materials. These payments covered about 40% of the total cost of purchased project materials. These financial constraints led the cooperators to apply strict tests of practicality and economic feasibility to each project and made them reluctant to build anything expensive. With the exception of an attached solar greenhouse, none of the site-built energy projects cost more than $2,000, and nearly all had estimated payback periods of seven years or less. The shortage of capital limited the adoption of wind energy systems, which are difficult to construct. The only wind system demonstrated was a factory-built 4-KW system that had an installed cost of $3,897 and met only about one-fourth of the farm family’s electric requirements. Its main value was demonstrating a direct tie-in with the rural electric system that serves Cedar County farmers (Aiken, 1979). High cost was also a factor in a cooperator’s decision not to build a methane digester that had been designed for his farm (Demmel, 1979). Cost estimates ranged from $8,000 for an 8,000-gallon digester (designed to produce 850 cubic feet of methane daily) to $17,000 for a 16,000-gallon system (designed to produce 1.700 cubic feet daily and compress it for use as a motor fuel). Other cooperators agreed that systems of this kind are not appropriate for the small crop-livestock farms they operate. A related constraint was lack of time for construction of projects. All of the cooperators had livestock operations that required several hours of labor daily. Experience showed that the best construction period was in late July and early August. Cooperators were also willing to attend daytime workshops in the winter and to construct projects when weather permitted. The breakdown of energy use reported in this project differs from what is usually reported by agricultural researchers, partly because the farms involved do not have separate electric meters for household and farm use. Tractors and pickup trucks also were filled from the same gasoline storage tanks and some propane tanks provided fuel for both home and farm-related needs. 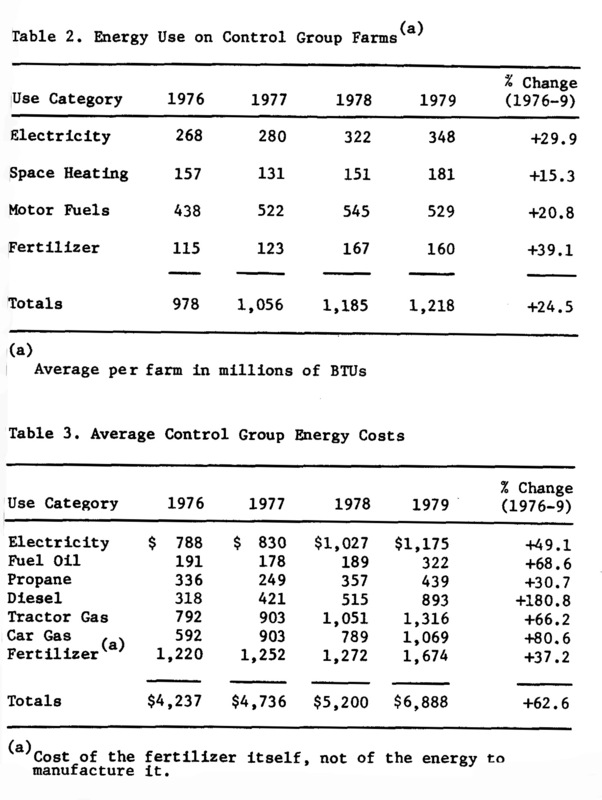 The overall energy use on the 48 farms in 1979, calculated on a gross energy basis, was as follows: 44% for motor fuels, 30% for electricity, 14% for space heating, and 12% for fertilizer.2 These totals are based on data from farm energy record books. About 42% of all the energy purchased was for household use, although data on this point were insufficient. It is difficult to compare this information with data categories from the national 1974 data base (Federal Energy Administration, 1976). This national study showed that fertilizer accounted for 31% of the energy used in agri­cultural production, irrigation for 13%, farm vehicles for 13%, preharvest field operations for 12%, and harvest operations for 10%. These figures, of course, do not reflect energy used for household purposes. The energy figure for fertilizer reported by both the cooperator and control group farmers was low because large amounts of livestock manure were available and because the figure represents 12% of all energy used (not farm use alone). These farmers also included legumes in their crop rotations, which helped meet nitrogen requirements. It was unusually difficult, as a result, for the cooperators to make a substantial reduction in energy use in the fertilizer category. The greatest potential for savings was in motor fuels. But energy use reductions were limited mainly to minimum tillage, keeping tractors tuned and plows and discs sharpened, reducing evaporation by painting fuel storage tanks white and installing pressurized caps, and making fewer trips to town. It is interesting to note that cutting purchased motor fuels by one-third, which perhaps could be achieved by a combination of vigorous conservation and on-farm alcohol production, would save more energy than the total used for either space heating or fertilizer. The main result of the three-year comparison is that the cooperators spent an average of $5,750 per farm for energy in 1979, which was 17% less than the $6,888 average for the control group farmers, for an annual savings of $1,138 per farm. During the three-year period, the control group increased its energy use by 25% (Table 2), with motor fuels increasing the most in absolute amount, but with fertilizer increasing at the fastest relative rate (39%). However, because this was a period of sharply rising energy prices, energy expenses rose 63% (Table 3). Diesel fuel was the leading contributor both in absolute amount and relative increase, but all categories showed sharp increases. In contrast, the cooperator farms had an energy use increase of only 9% and there was even a slight decline following the first year’s increase of 11% (Table 4). The increase was well below that of the control group in all categories, and energy use for space heating actually declined by 16%. But despite the very modest increase in energy use, the energy bills for the cooperator farms went up by 44% because of the increase in energy prices (Table 5). Still, this was well below the 63% increase for the control group. As with the control group, expenses for diesel fuel increased most rapidly (128%), while propane costs declined because the space heating demand was reduced through insulation, wood burning, and solar heating systems. The difference between the two groups’ use of fertilizer was quite important. The 18% increase reported by the cooperators over three years compares with a 39% increase for control group farmers. This probably reflects the results of soil testing assistance provided to the cooperators in 1978, continued emphasis on nitrogen-fixing legume crops and effi­cient manure handling, and the adoption of manure composting. Tables 6 and 7 provide a more detailed year-by-year breakdown of energy purchases by farmers in the two groups. The cooperators reduced their energy consumption in three categories (fuel oil, propane, and tractor gasoline) while the control group farmers increased consumption in every category. The increases reported by the cooperators were also less in all instances where increases were reported by both groups of farmers (electricity, diesel, car gasoline, and fertilizer). Farm size remained almost constant for both groups during the three-year period (up to 364 acres from 357 for the cooperators and up to 361 acres from 357 for the control group farmers). Average annual inventories of grain, hay, silage, and livestock, which were calculated from record book entries by both groups of farmers, were comparable throughout the project period. A breakdown of energy costs by different types of farming operations suggests that operators of diversified farms would probably find it easier to become energy self-sufficient than would operators of specialized dairy or hog farms. 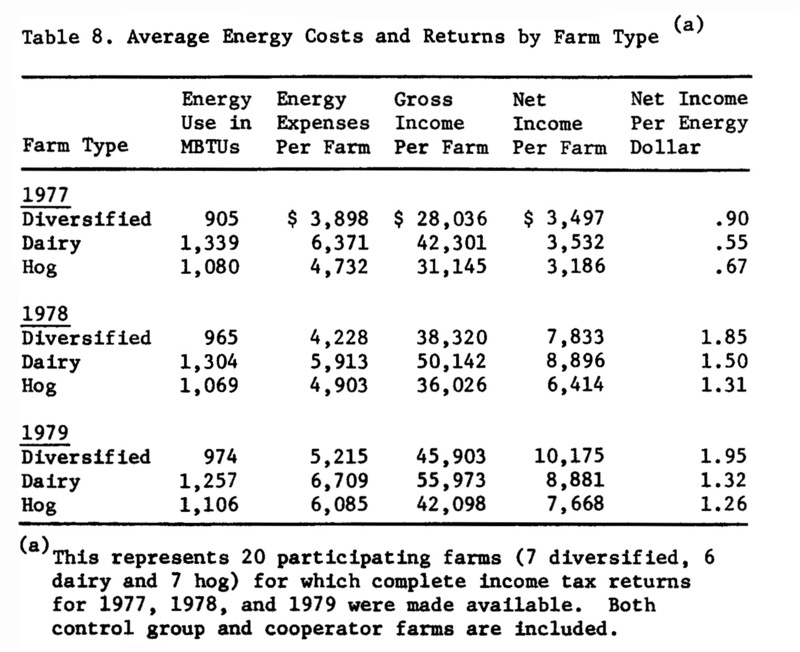 Table 8 shows, for example, that the net income returned for each dollar spent for energy was greater for diversified farms for all three project years. The amount spent for energy by operators of diversified farms also was considerably less for all three years. Inability to insulate control group farmers from project information disseminated in the community and throughout the region turned out to be a serious design flaw. The high visibility achieved by the project in Cedar County had not been anticipated. 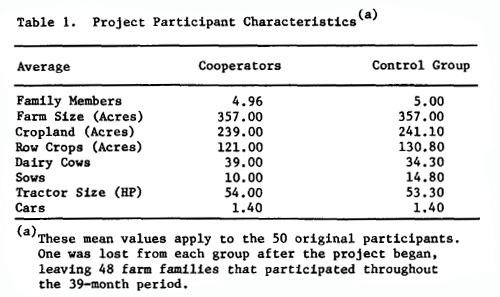 A 1978 project evaluation concluded that keeping detailed energy records and being exposed to word-of-mouth and published reports of project activities in the community made members of the control group much more aware of their energy costs and consumption patterns (Associates in Rural Development, Inc., 1979). The evaluators reported that 23 of the 24 control group farmers said they had become more aware of their energy costs since they had become involved in the project. The evaluation report also noted that ten farmers reported that they were planning to begin new energy projects in the near future and six had actually begun new energy-saving efforts. This represents 20 participating farms (7 diversified, 6 dairy and 7 hog) for which complete income tax returns for 1977, 1978, and 1979 were made available. Both control group and cooperator farms are included. This suggests that the energy consumption difference between the two groups would have been considerably greater if the control group could have been insulated from community and other outside influences. It also suggests that energy record keeping and community energy information programs may be sufficient to motivate farmers to take action to reduce energy consumption and adopt new energy-saving practices. The difference in energy consumption between the two groups of farmers would also have been greater if all the cooperators had built the full range of proven energy systems that appeared to be appropriate for their farms. The cooperators were encouraged to build every system that appeared to be appropriate for their farms and had unlimited access to cost share and technical assistance. The level of participation was an individual decision, however, and no attempt was made to push them into taking action they were reluctant to take. It is clear that the number of energy systems built and the amount of energy saved would have been much greater if a “model farm” strategy had been employed. The self-selection approach used, however, made each cooperator responsible for determining the appropriateness of each innovation or practice adopted, and meant that the farmer had more of a commitment to making the innovation succeed. The wide range of energy systems constructed on cooperator farms, as a result, were all being used when the project ended. All of the cooperators participated in project workshops and other educational activities, filled out energy record books, completed weatherization and soil sampling programs, and adopted other energy conservation practices. Nearly all completed one or more cost-shared devices or practices from a list of “minor innovations.” The list included solar food dryers, window box solar collectors, wood heating, and minimum tillage. 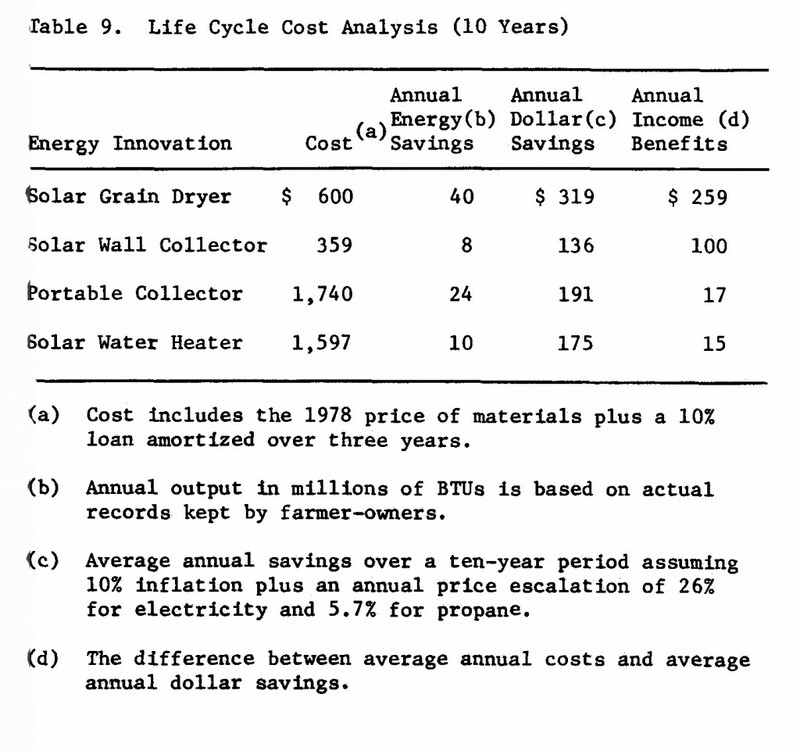 Only ten completed one or more projects from a list of “major innovations.” These included solar grain dryers, solar greenhouses, solar water heaters, solar wall collectors, wind generators, roof-mounted collector systems, and portable solar collectors. With the exception of the wind system, which was purchased, the cooperators built all of these innovations. A staff analysis of economical innovations that could have been adopted on the 24 farms indicates that they would have reduced annual overall energy consumption by 917 million BTUs and cut annual expenditures for energy by $5,850. This averages out to $244 per farm. The estimated savings for the ten farms that adopted solar and other “major” innovations actually averaged about $120. These savings would increase each year, of course, as energy prices rise. Table 9 shows that four of the most popular innovations would save enough money to pay for themselves in ten years and return an annual income benefit besides. Annual energy savings are based on figures obtained in monitoring cooperator-built systems. The project offered an opportunity to observe system­atically what a group of full time farmers would do when provided with technical and other assistance in developing their own energy programs. It was an opportunity to see how they perceived the economic value of energy-related changes, what factors they considered in determining the appropriate­ness of energy innovations and practices, and how they decided whether to invest scarce resources in energy systems that appeared economically feasible over a period of years but did not provide immediate economic benefits. Although the amount of energy saved would undoubtedly have been much greater if a “model farm” strategy had been adopted, a project of this kind would have demonstrated little beyond whether a particular innovation or practice performed well and what it would cost under ideal conditions. This information was already available, in most cases, when the project got underway. The real need was to find out more about the adaptability of low-cost energy systems and the way energy decisions are made by farmers. Farmers with more available capital probably would have done some things differently. But they, too, would have had to make decisions about appropriateness and economic feasibility and the factors they would have considered would have been similar. The project does not begin to answer all the questions that will arise as farmers move toward energy self-sufficiency. But it does identify many of the practical problems that will be encountered and provides some useful information that will help show the way. Aiken, Rob. 1979. Wind electric power generation and connection to a rural electric cooperative in northeast Nebraska. Paper presented at a USDA-DOE workshop on wind energy applications in agriculture. Iowa State University, Ames, Iowa. Associates in Rural Development, Inc. 1979. Evaluation of the Small Farm Energy Project at the Center for Rural Affairs. Burlington, Vermont. Blobaum, Roger. 1980. Small is renewable: the impact of energy policy on farm structure. In Perspectives on the Structure of American Agriculture. Rural America, Washington, D.C.
Buttel, Frederick H., William Lockeretz, Martin Strange, and Elinor Terhune. 1980. Energy and Small Farms: A Review of Existing Literature and Suggestions Concerning Future Research. National Rural Center, Washington, D.C.
Demmel, Dennis. 1979. Anerobic digestion for methane genera­tion on small farms in northeast Nebraska. Paper presented at the Mid-America Bio-Mass Energy Workshop. Purdue University, Lafayette, Indiana. DOE. 1978. Solar Energy for Agricultural and Industrial Process Heat. Report No. CS-0053. Washington, D.C.
Federal Energy Administration. 1976. 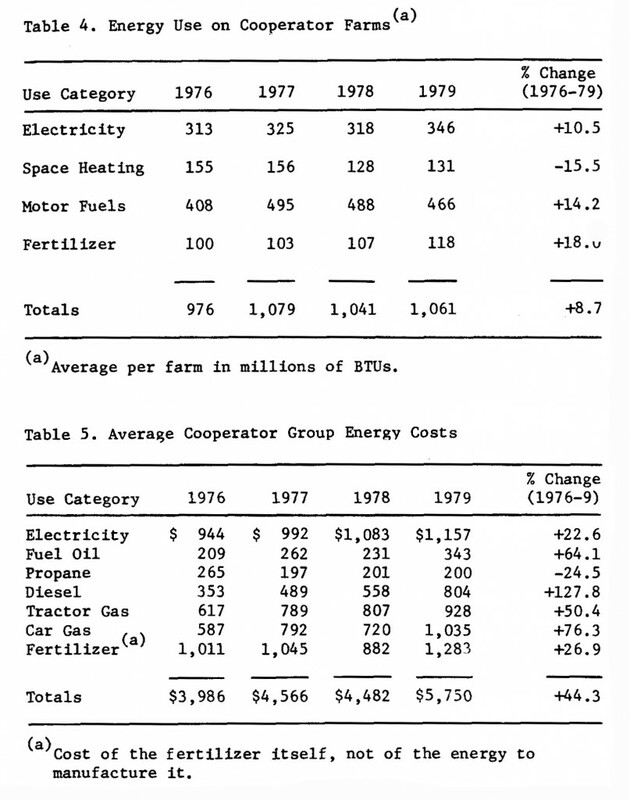 Energy and U.S Agriculture: 1974 Data Base. FEA/D-76/459. USDA. 1979. Energy alternatives and actions for U.S. Agriculture. Report Prepared for the National Agricultural Research and Extension Users Advisory Board, Washington, D.C.
USDA. 1980. Economic Indicators of the Farm Sector: Income and Balance Sheet Statistics, 1979. Statistical Bulletin No. 650. Washington, D.C.
Williams, Jim. 1979. Statement to Subcommittee on Agricultural Research and General Legislation, Senate Committee on Agriculture, Nutrition, and Forestry. Washington, D.C.
1. This figure does not include the energy components of the $6.7 billion spent for fertilizers and lime, the $3.1 billion for pesticides, or the $4.1 billion for machine hire, custom work, and contract labor. 2 Pesticide energy was not calculated. It is quite small on Corn Belt farms compared to fertilizer use. Electricity was computed at 10,240 BTU/kwh, or a conversion efficiency of 33%.